The Lexmark T642tn is a high-speed monochrome laser printer that is suitable for workgroups with medium-to-high-volume printing demands. This is one of several models in the T642 series of printers, which primarily vary in terms of installed memory size and/or the capacity of the standard paper input tray. It will print on a wide range of media, including plain paper, card stock, labels and envelopes. In addition to standard toner cartridges, you can use high capacity cartridges to both save money and increase your productivity. Optional duplex capability is available to help reduce the amount of paper used for print runs. This printer weighs 26 kg and measures 535 x 436 x 523 mm. It has a standard paper capacity of 1,100 sheets, and optional additional input trays can increase the capacity up to 4,100 sheets. To facilitate the workflow within your office workgroup, an optional 5-bin mailbox is available in addition to a variety of other finishing options. The printer features USB and ethernet network connection capabilities, while wireless connectivity is not included, it is available as an optional add-on. 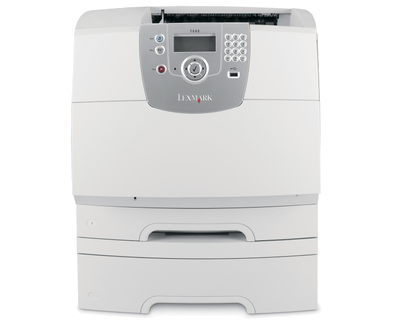 The Lexmark T642tn is equipped with a 457 MHz processor and 128MB of RAM. The printer’s maximum monthly duty cycle is 225,000 pages, although Lexmark recommends keeping monthly printing volumes between 3,000 and 19,000 pages. The printer’s user-friendly control panel makes it easy to understand the unit’s printing and maintenance functions, and it also offers unique optional application solutions for bar code, PRESCRIBE, PDF, IPDS or encrypted data printing. It has a time to print the first page of less than 8.5 seconds, and a print speed of up to 43 ppm. Its print resolution is 1200x1200 dpi. The printer does not offer colour printing, copying, faxing or scanning capabilities, which would require you to purchase an additional device if you require any of these functions.